Mounting evidence suggests that GDP growth is damaging the natural environment and unlikely to be ecologically sustainable in the long-run. At the same time, an annual GDP growth rate of around three percent is regarded as the minimum necessary to prevent unemployment from escalating. Clearly, a trade-off exists between environmental goals and employment goals, yet this trade-off has been largely ignored or denied. What existing paradigms offer a possible foundation for further investigation into issues dealing with both the environment and employment? What specific initiatives can be implemented to deal with unemployment given that any potential solution must be consistent with responsible macroeconomic policy? To what extent can ecological tax reform provide a solution to the environment-employment dilemma? Under what circumstances is it clear that certain forms of employment generation are antithetic to the goal of ecological sustainability? How can more favourable employment-generating opportunities be exploited in ways which lower unemployment or achieve full employment without the need for ecologically-destructive GDP growth? This book will no doubt stimulate a broader discussion on the issue, and it may just begin a process that leads to the eventual emergence of a viable policy strategy to generate a sustainable, full employment future. 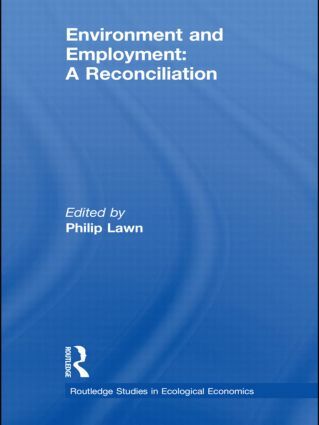 This book will be of interest to decision-makers, civil servants, researchers, and NGO employees as well as students of environmental and ecological economics and issues related to employment and unemployment. Why focus on the connection between the environment and employment? Why have Post-Keynesians (perhaps) inadequately dealt with issues related to the environment?